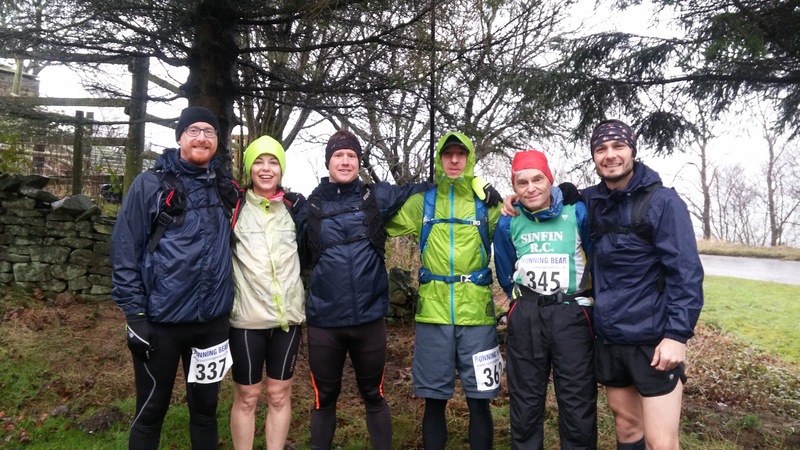 The first ‘champs’ race of the Sinfin fell running year for 2017 was Lamb’s Longer Leg on Sunday 15th Jan. Twas a pre-entry only race, with 5.4km of distance and 290 meters of climb this is an ‘A Short’ course. 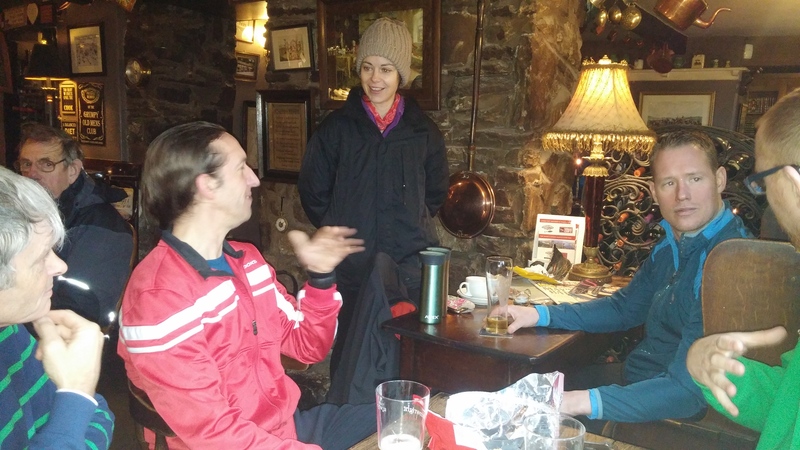 Meeting at the Lamb Inn with the start a 800m jog down the road towards Chinley. 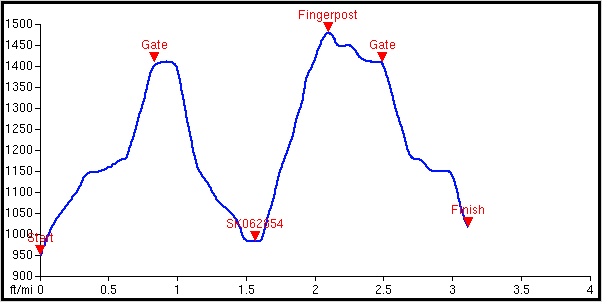 With an ‘M’ shaped profile, the first climb begins right off the start line with the finish enjoying the opposite action. As far as we know, this is the first time anyone from the club has attended this particular race, although it’s been going since 2003. As for the race itself; epic. 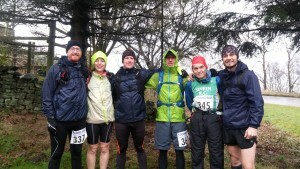 Bona-fide fell course; full-kit was mandated, tough & varied terrain, difficult weather, clag down. It was a belter. 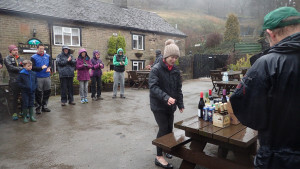 Everyone had a great time and got round safely. 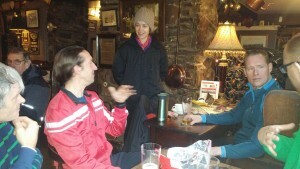 Then straight into the Lamb Inn for a pint (or cup of tea). What’s more, Caroline won the ladies v45. 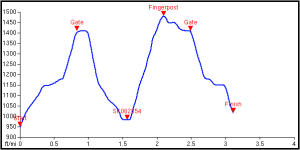 The next champs race will be Hoppit’s Hill on 29th Feb.
Notes regarding the new points system: You can see the age and gender adjustments working well; although I finished ahead of Paul by over 7 minutes, I only ended up with 5pts fewer. I was ahead of Caroline by over a minute and a half but she’s still 10pts better off. Simon was on semi-cruise so his pts are higher than they might have been on another day. This all ‘feels’ about right. Remember, it’s a long year and race attendance will pay dividends (for various reasons), especially for those who might not be quite as good vs quicker runners who only do a handful of events. However, the bottom line is, just enjoy it.